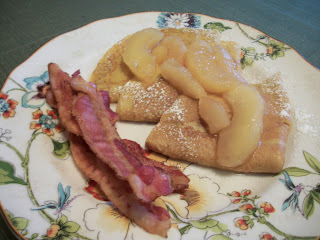 Here's a fun and different way to incorporate pumpkin into your breakfast or brunches - I love crepes cause they're a bit lighter than pancakes. And you can dress them up in so many ways - these I kept relatively simple - no filling, just topped with some cooked apples and real maple syrup. With a side of salty breakfast meat, it made a wonderful autumn breakfast. Find more great recipes at Mix it Up, Inspire Me, Inspiration Monday, Hearth and Soul, Clever Chicks, Create Link Inspire, What's Cooking, Full Plate, Showcase Your Talent, Foodie Friday. In a small saucepan over medium-low heat, warm the milk and butter until the butter is melted. While the milk is warming, whisk together the eggs, pumpkin, and vanilla. Gradually stir the warm milk in the pumpkin mix. In a separate bowl, whisk together the flour, sugar, baking powder, salt, cinnamon, ginger, and nutmeg. Stir the wet ingredients into the dry ingredients, whisking until totally smooth. 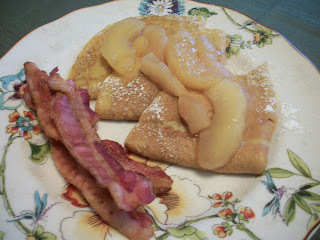 Pour about 1/3 cup batter into a hot crepe pan or nonstick skillet coated with nonstick spray. Cook over medium heat for about a minute or until crepes look somewhat dry on top; flip over and cook for another 30 seconds. Folk crepes into quarters and place onto serving plate. Continue with remaining batter. Top with apples and maple syrup. Serves 6. Oh wow, I never thought about making pumpkin crepes, Sarah! What a fantastic seasonal idea! Thank you so much for being a part of our Hearth and Soul Hop. Your Pumpkin Crepes look fantastic! Thanks so much for sharing with Full Plate Thursday and have a great day.